Canyon De Chelly National Monument was established in 1931. 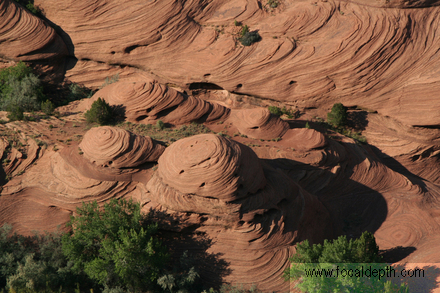 The valley has been inhabited from promitive peoples 2000 years ago, through the Anasazi civilisation of the twelfth century, which occupied a large area of the South West before suddenly disappearing, to the Navajo who have lived here for the last 300 years.The monument consists of two major canyons- Canyon De Chelly (which is pronounced de shay) and is derived from the Navajo word meaning "rock canyon" and Canyon del Muerto (Spanish for "Canyon of the Dead") plus several smaller canyons. The canyons extend for more than 100 miles, draining the seasonal runoff from the snowmelt of the Chuska Mountains.The North Rim Drive overlooks Canyon del Muerto. From viewpoints you.ll see Ledge Ruin, which was occupied, between AD 1050 and 1275 and nearby a lone kiva that was reached by means of toeholds cut into the soft sandstone wall. Antelope House, once home to 20 to 40 people, takes its name from the Navajo paintings of antelopes on a nearby cliff wall believed to have been done in the 1830s.Further along the drive is Mummy Cave named for two mummies found in burial urns. It is actually a giant amphitheatre consisting of two caves believed to have been occupied from A.D. 300 to 1300.There.s a three-story structure similar to dwellings at Mesa Verde, and altogether there are 80 rooms. The final stop on the North Rim Drive is at Massacre Cave Overlook, where Spanish troops in 1804 killed about 120 Navajo.The best time to see the ruins along the North Rim is in the morning when they.re bathed in sunlight. South Rim Drive climbs slowly and from overlooks you.ll see the junction of Canyon del Muerto and Canyon de Chelly, and the Junction Ruin with 10 rooms and 1 kiva. Also visible is First Ruin perched on a long narrow ledge, with 22 room.s and 2 kivas. The drive ends at the spectacular overlook of Spider Rock where according to legend the Spider Woman lives on top and keeps the bones of her victims there.